Sometimes a mug of hot cocoa is exactly what you need for a cold afternoon with a book, after cross-country skiing, or when you’re curled up in front of the fire with family or friends. It’s warm, comforting, and sweet. But it could get a little boring. Time for an upgrade. That doesn’t mean you’ve got to hand-grate imported chocolate into goat milk you milked yourself that is heating in a special copper pot over the fire, though. 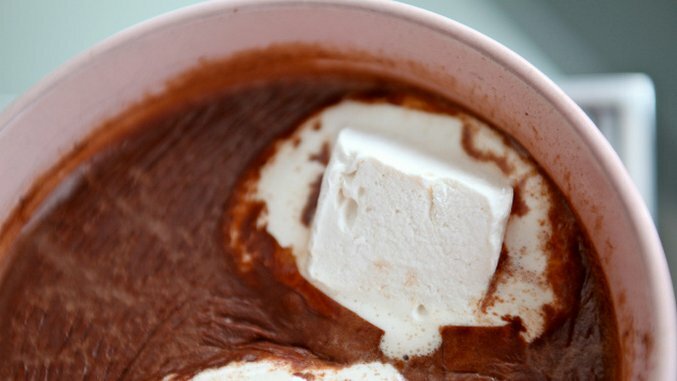 Try some of these fun and easy twists to make your hot cocoa an experience. Chocolate and warm woodsy spices like cinnamon and nutmeg pair together well, so sprinkle a little in your mug next time. Add some ginger, cloves and a tablespoon of molasses to make it a gingerbread drink. Drop in a cinnamon stick, or poke it into your whipped cream. If you like hot flavors, pep things up with a dash of cayenne pepper and cinnamon to make Mexican hot cocoa. Swap out the milk or water you normally make hot chocolate with and use coconut milk instead. You’ll get a subtle added flavor. To fancy things up a bit, dampen the rim of your mug and dip it in toasted coconut flakes. This is the hot version of a malted shake for a cold day. Buy malted milk powder in the baking aisle. Stir in a tablespoon of the powder when you make your hot cocoa. Serve in a tall skinny mug and drink it through a straw. For an over-the-top treat, finely crush a chocolate sandwich cookie and stir it into your drink. Instead of whipped cream, float a tablespoon or two of vanilla ice cream on top and drizzle with chocolate sauce. Instead of marshmallows, top your drink with a scoop of marshmallow fluff and drizzle with caramel sauce. The fluff will slowly melt into the drink for a gooey confection. Dip the mug rim in crushed peppermint candies and add a tiny splash of peppermint extract to the hot cocoa. Pop in a candy cane for stirring and you’re fully festive. This looks great served in a red mug. Stir a tablespoon of pumpkin puree and a quarter of a teaspoon of pumpkin pie spice into your hot chocolate and suddenly you’ve got an entire dessert in a drink. Sprinkle a little of the spice on your whipped cream. Serve in a tall glass pedestal mug to make it extra fancy. Dip dampened rims of your cups into crushed graham crackers and broil some marshmallows, then pop them on top of your drink for an instant campfire in a cup. Tin campfire mugs are perfect for serving, particularly if you’re sipping in front of a fire. Instead of your usual cocoa mix, stir a couple heaping spoonfuls of Nutella into your hot milk. The hazelnut flavor gives the drink a wonderful richness. If peanut butter’s your spread of choice, make your regular hot cocoa and stir in a tablespoon of creamy peanut butter. Sprinkle chopped peanuts on top of your whipped cream. Maybe you need a break from chocolate (it happens!). That doesn’t mean you can’t have hot chocolate. Melt white chocolate pieces in hot milk and stir in a splash of vanilla extract. Dip the mug rims in crushed vanilla wafers. Brette Sember is crazy for hot chocolate and cookies. She’s the author of Cookie: A Love Story: Fun Facts, Delicious Stories, Fascinating History, Tasty Recipes, and More About Our Most Beloved Treat. Her website is BretteSember.com.